Sam Houston State University's Biodiesel Power Output Measurement Team outside the group's new home, with their donated $32,000 New Holland tractor, include, from left: Joe Muller, associate professor of agriculture; Doug Kingman, assistant professor of agriculture; Jennifer Largent, graduate animal sciences major from Neches; Chase Kizziah, senior agricultural mechanics major from Richmond; Justin Rogers, senior agricultural mechanics major from Normangee; Jordan Kiker, senior agricultural mechanics major from Winnie; and Corey Brown, senior agricultural mechanics major from Palestine. The questions concerning our fuels of the future are many, but a group of agriculture students at Sam Houston State University are helping provide some of the answers. 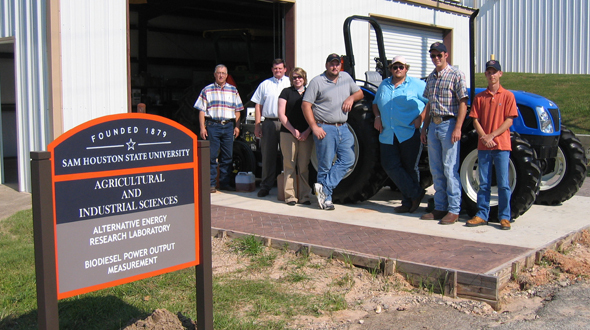 Led by agriculture professors Doug Kingman and Joe Muller, a five-student team is working in the Department of Agricultural and Industrial Sciences' new Alternative Energy Research Laboratory located in the Holleman Field area of the campus. Inside the lab is a shiny blue $32,000 tractor furnished by the New Holland company and a $23,000 dynamometer that is hooked up to the tractor to measure its performance on various biodiesel mixtures. When Rudolph Diesel built an engine in Germany in 1893 it ran first on peanut oil, and he believed fuel made from plants was the real future of his engine. Appropriately, SHSU senior agriculture mechanics major Jordan Kiker last year began testing an older tractor using peanut oil. Kiker grew up on a rice and soybean farm near Winnie, Texas, and has been around tractors all his life. He credits Kingman, who had been doing biodiesel testing at Illinois State for four years before coming to SHSU a year ago, with peaking his interest. "The oil used in one of the first demonstrations was left over vegetable oil from a fish fry that the Agricultural Mechanics Club had put on," said Kiker. "The only treatment the oil had was it being strained through a patch of blue jean denim." Kiker made a minor modification to an old Ford tractor and it ran. He has since learned lots about biodiesel and Kingman believes he has an aptitude for research in this area that could eventually lead to his doctorate. "Oils like soybean, cotton seed, and sunflower are becoming more plentiful," said Kiker, explaining that peanut oil is more expensive because of the short supply. "There are a few exotic plants that yield the most oil in pounds per acre," he said. "These include the palm which produces palm oil and the jatropha curcas plant, which are not yet grown in America." Other issues relating to possible increased use of diesel fuel made from plants include the fact that the biodiesel produces less carbon dioxide, which is better for the greenhouse effect, but more particulates, which is worse for smog. How much energy it takes in such forms as tractor fuel and fertilizer to produce a certain amount of biodiesel, is another issue, as well as environmentalists' concerns that if biodiesel production is accelerated more forests will be cleared for cropland, producing other problems. An entire segment of the current research, for instance, is concerned with algaculture, or the production of biodiesel from algae ponds at wastewater treatment plants. This process would not require agriculture production energy or destruction of forests. The SHSU group is working on a small segment of the overall problem, but one that could be valuable even in the short term to farmers. "The focus of our research has revolved around the desire to determine if several biodiesel blends generate more horsepower than the traditional No. 2 diesel made from crude petroleum," said Kingman. "Results of our tests so far indicate that B5, a blend of 5 percent pure soybean oil and traditional diesel, slightly outperform the other biodiesel/diesel combinations." In addition to power output measurement, the consumption of each fuel was determined while the tractor was under heavy and light loads. Future testing will include 100 percent biodiesel made from cotton seed, by-products of animal processing, and sunflowers. In addition to Kingman, Muller and Kiker, other members of the team include Jennifer Largent, graduate animal science major from Neches; Chase Kizziah, senior agricultural mechanics major from Richmond; Justin Rogers, senior agricultural mechanics major from Normangee, and Corey Brown, senior agricultural mechanics major from Palestine. Members of the team including Kingman, Muller, Brown, Kiker and Kizziah were recently invited by Todd Staples, Texas Commissioner of Agriculture, to participate in a Fort Worth celebration marking the 100th Anniversary of the Texas Department of Agriculture. The real celebration, they say, will come when there are more answers to the many questions relating to the production and use of fuels from plants.